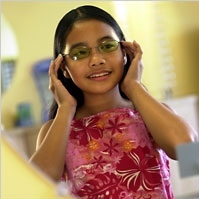 Over 10 million children in the United States suffer from undetected vision problems. These vision problems often contribute to difficulties in the classroom, even in students who score 20/20 vision in a vision screening. The reason for this is that 20/20 vision simply means that someone can see something 20 feet away that they are supposed to be able to see at 20 feet away. 20/20 vision does not account for eye tracking skill, or a child's tremendous ability to focus his or her eye sight over a short period of time. When left untreated, these vision conditions often interfere with a child's learning development. This difficulty often negatively influences self-esteem, which further impairs learning development. Regular eye examinations can catch many of these problems, offering hope of improving visual ability and comfort.